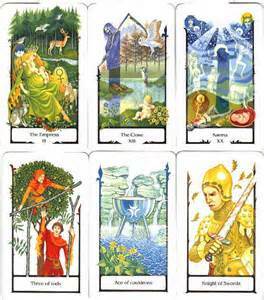 My first real exposure to paganism came through the tarot. A friend of mine had a deck and, as these things go, having had a few readings, I became interested in reading for myself. I prided myself on my pragmatism and good sense even then, and didn't really get some of the superstitions around things like buying a deck ('they' are said to say you shouldn't buy your own) and how you store it (again, the ubiquitous 'they' will only consider black silk). So, naturally, I purchased a deck for myself. Since this was back in the early 1990s and I didn't have a computer (I *know*! ), I visited a few New Age type shops and chose from what was physically there. The Tarot of the Old Path was what I found waiting for me. I fell for its beautiful representation of the High Priestess: mysterious, strongly associated with the animals and - get this - silver accented. I would go on to love its gorgeous imagery of the Empress, with her full round belly and suckling infant, and its phenomenal presentation of Death, renamed 'The Close' and featuring another happy infant as well as the traditional reaper figure and natural symbols of death and rebirth such as the snake, butterfly and owl. Several of the things I particularly appreciated about the Old Path deck (including its gentle sense of death as part of nature) I was to find out came from its specifically wiccan belief base. Those cards lead me into discovering much more about this take on the world, although I was never meant to be wiccan as such. I have many decks now, and also the odd oracle pack - although I always feel more confident reading with a tarot pack. I will always love the tarot for what it has taught me about our journey through life in the broadest sense, as well as the specific wisdom I've gleaned from it.